Childhood memories are made of bicycling through those nameless lanes to explore something new every evening. Vikram Pendse’s cycle museum, located at a quaint Karvenagar bungalow, will not only get you nostalgic, but will leave you awestruck with its unique collection of everything vintage and wonderful. As you enter Vikram Pendse Cycle Museum, your eyes meet the series of vintage bicycles, tricycles and pedal cars, basking in glory in the soft yellow ceiling lights. Get closer and you realise that almost all cycles in this three-storey museum, are over a century old. Some of them, in fact, have been collected from scrapyards and later restored by Vikram with the help of his dear friend and a veteran cyclist, Pandurang Gaikwad. The place boasts of over 150 collectibles – from geared racing cycles to children’s bicycles, tandem bicycles, cruisers, beach cycles, erstwhile cycle ads, nuts & bolts, tyres, spare parts, gears, seats, dynamos, air pumps, lamps and many more. But that’s not even close to what we found in this beautiful place. Vikram’s passion for cycles goes back to 1992 when his father gifted him a BSA Paratrooper, a collapsible cycles that was manufactured during the Second World War. The oldest of this lot is the 1914 All-Black Golden Sunbeam Tricycle, first manufactured in England, around the time of World War I. The cycle, by the way, was recovered from a scrapyard! Apart from cycles, check out the awesome collection of vintage household artifacts. From a very old Zippo lighter to sewing machines, 70-year-old radio sets, locks and old-school buttermilk churner. 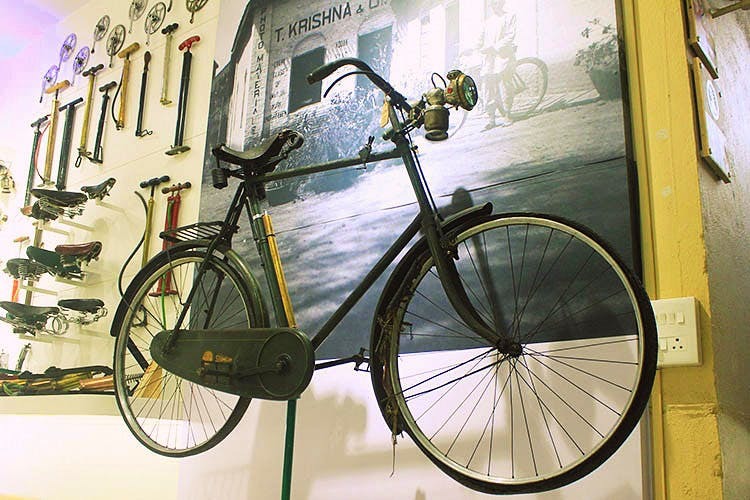 If you love everything old and antique and a collector yourself, Vikram Pendse Cycle Museum is a must-visit.